An inclusive culture of high expectations sees apprentices challenged and supported to achieve their full potential at the University of Sheffield's AMRC Training Centre, according to a new report by Ofsted. 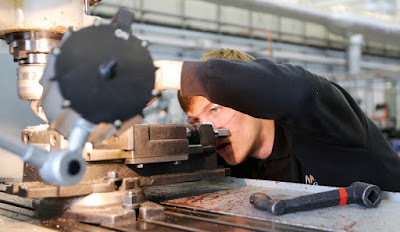 At the multimillion pound centre on the Advanced Manufacturing Park (AMP) the focus is on students aged from 16 upwards, taken on paid apprenticeships by big names and local manufacturers. Part of the The University of Sheffield Advanced Manufacturing Research Centre (AMRC) with Boeing, apprentices have opportunities to progress on to postgraduate courses, doctorates and MBA levels. The report published this week said there has been a "relentless focus" on improving the quality of education apprentices receive at the training centre and weaknesses identified at a previous inspection had all been successfully addressed. Judged as "good" in all areas by Ofsted following a full inspection last month, inspectors praised the centre's leaders and managers for "successfully creating an inclusive culture of high expectations throughout the apprenticeship provision’ and for carefully planning the development of apprenticeship provision in a way that is "well aligned" to the needs of employers. "Apprentices benefit from very well-equipped training facilities, high-quality resources and knowledgeable teachers with strong industry experience," the report adds. "Apprentices demonstrate the exemplary standards of behaviour expected of successful employees. They are courteous and helpful, attend well and work to deadlines effectively." In 2017, Ofsted judged that the centre "requires improvement." Nikki Jones, director of the AMRC Training Centre, said: "Since the last inspection we have been working relentlessly and I'm thrilled we are now on our journey towards becoming outstanding. We're pleased inspectors recognised that we have made sustained and continuous improvement and can see how that is having real impact in the success and achievement of our apprentices. "This result has been achieved by working hand-in-hand with the wider University of Sheffield, our Industry Board, employers and our apprentices – and we’re extremely grateful for that continued support. "We're meeting the skills needs of the economy through the careful way in which we have designed our curriculum and how we are delivering it around the regional need." Keith Ridgway, founder and executive dean of the University of Sheffield AMRC, added: "This is great news for Nikki and her team and for the growing numbers of young people across our region who see engineering apprenticeships and degree apprenticeships as a debt-free pathway to a challenging and rewarding career that makes a positive impact on the world around us. "It's great, too, that the report recognises how Nikki and her team have successfully created an inclusive culture of high expectations for our apprentices, and how this leads to exemplary standards of behaviour in apprentices who are confident, courteous and helpful, attend well and work to deadlines effectively. We produce great engineers and good citizens. "As the report says, there is a significant need for skilled engineers in the region, both from indigenous companies and from inward investors who increasingly see the Sheffield City Region as the place to put down roots. "This Ofsted report gives us all the more reason to want to widen access and participation both to meet the growing demand for skills and to open up new opportunities for communities in our region who can sometimes feel left behind and ignored." The report remarks on outcomes for apprentices, action to improve the retention of female engineering apprentices, the quality of teaching, learning and assessment is good, along with the personal development, behaviour and welfare of apprentices. Since opening in January 2014, 1,300 apprentices from more than 300 employers in the city region have been trained in engineering skills, which have helped businesses to grow and secure a sustainable future.